Representative of the Jewish community in Germany during the Middle Ages, and in Russia almost to the present day. When the government issued a decree against the Jews of any particular locality, the latter would send their shetadlan to the seat of administration to endeavor to have the legislation modified. Thus the Council of Four Lands would send several shetadlanim under these circumstances to Wilna (See Jew. Encyc. iv. 306), s.v. Council of Four Lands). 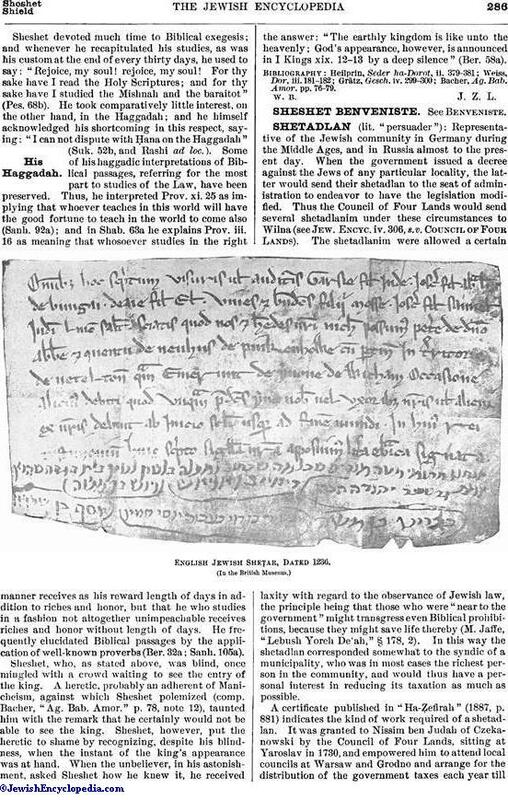 The shetadlanim were allowed a certain laxity with regard to the observance of Jewish law, the principle being that those who were "near to the government" might transgress even Biblical prohibitions, because they might save life thereby (M. Jaffe, "Lebush Yorch De'ah," § 178, 2). In this way the shetadlan corresponded somewhat to the syndic of a municipality, who was in most cases the richest person in the community, and would thus have a personal interest in reducing its taxation as much as possible. 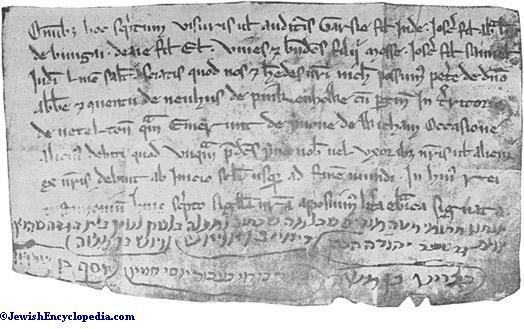 English Jewish Sheṭar, Dated 1236. A certificate published in "Ha-Ẓefirah" (1887, p. 881) indicates the kind of work required of a shetadlan. It was granted to Nissim, ben Judah of Czekanowski by the Council of Four Lands, sitting at Yaroslav in 1730, and empowered him to attend local councils at Warsaw and Grodno and arrange for the distribution of the government taxes each year tillthe next meeting of the council. As recompense he received his passport and eight Polish gulden per week from the council treasury. 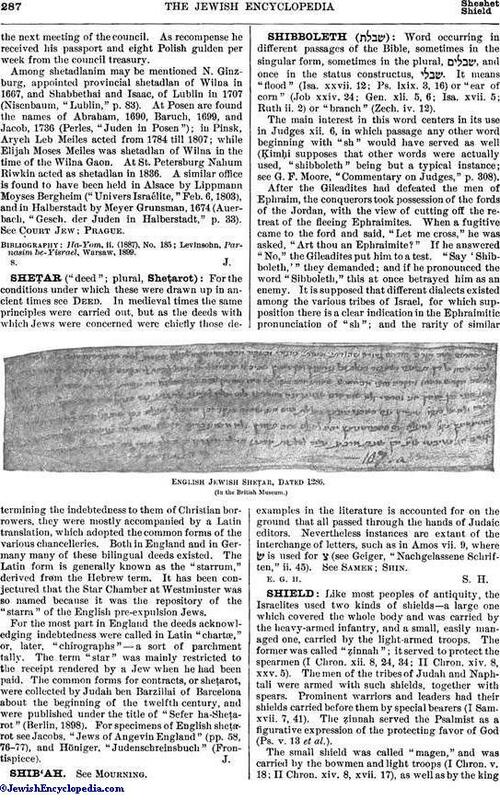 Among shetadlanim may be mentioned N. Ginzburg, appointed provincial shetadlan of Wilna in 1667, and Shabbethai and Isaac, of Lublin in 1707 (Nisenbaum, "Lublin," p. 83). At Posen are found the names of Abraham, 1690, Baruch, 1699, and Jacob, 1736 (Perles, "Juden in Posen"); in Pinsk, Aryeh Leb Meiles acted from 1784 till 1807; while Elijah Moses Meiles was shetadlan of Wilna in the time of the Wilna Gaon. At St. Petersburg Nahum Riwkin acted as shetadlan in 1836. A similar office is found to have been held in Alsace by Lippmann Moyses Bergheim ("Univers Israélite," Feb. 6, 1803), and in Halberstadt by Meyer Grunsman, 1674 (Auerbach, "Gesch. der Juden in Halberstadt," p. 33). See Court Jew; Prague. Levinsohn, Parnasim be-Yisrael, Warsaw, 1899.